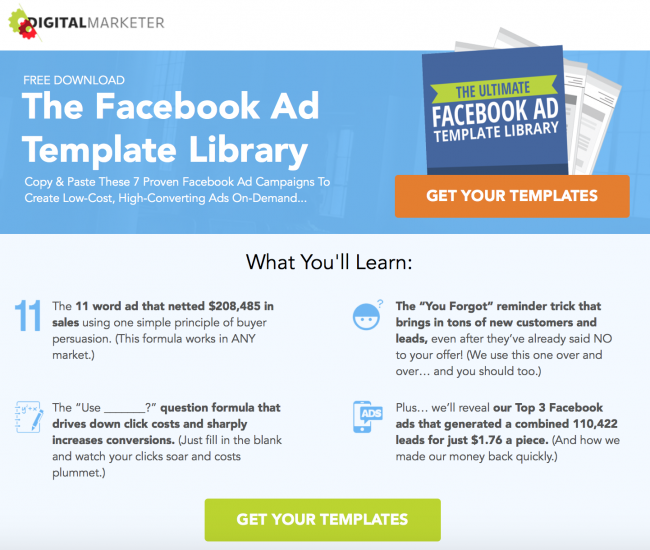 Ready to create your first Facebook ad? Have a new business, product or service you want to promote? 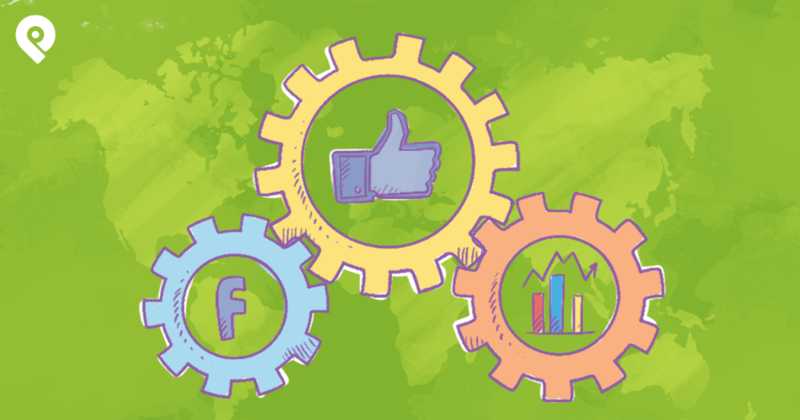 With 6 million businesses using Facebook ads to reach customers, you need a competitive edge! ... and leave your audience begging for more. Let's go! Did you know that Facebook ads are more effective in targeting audiences by interests than Google Adwords? That’s pretty impressive! And information you can use to catch the eye of your customers by better understanding their interests. From geographic location to education level, careers, interests and spending habits - Facebook has a wealth of information to help you build specific target audiences. Just have a look at the diversity of audiences you can target for your business. When you use customer interests to build out your Facebook ad target audience, you’re not only replicating the qualifying characteristics of a customer, but also saving money. If you’re new to Facebook ads, you should know that like other streams of online advertising, Facebook ads can be pay-per-click. And to that I say, let’s not pay for unqualified Facebook users to click on your Facebook ads! AdEspresso recently ran an experiment indicating that interest-based Facebook ads only cost businesses 3 cents per click versus poorly targeted Facebook ads costing over 14 cents per click. Just think about those cost savings. Not only are you saving money, but you’re not narrowing your spectrum of potential customers at all. Take, for instance, Adidas’ 2010 World Cup Facebook ad strategy. By leveraging their customers’ interests, they were able to reach over 1 million fans through Facebook ads alone. 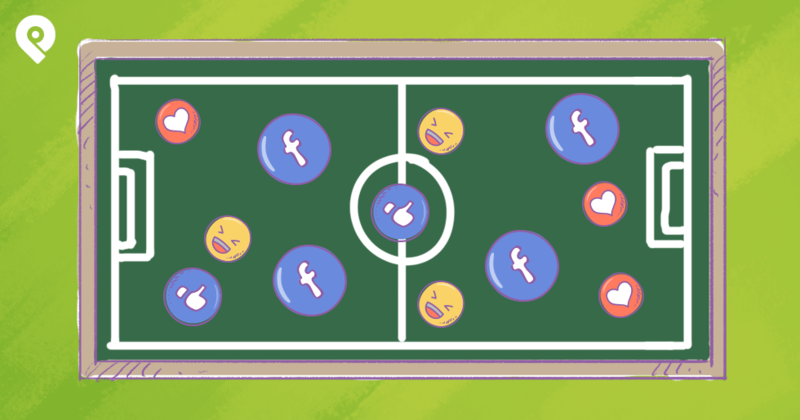 “During the 31 days of the World Cup, the [Adidas] centered its conversation around Adidas Football’s Facebook Page – the free public profile that enables companies to share their business and products with users on an ongoing basis. The sports giant also enabled the Page to be a place where fans of Adidas Football could donate directly to charity. While it might be difficult to reach over 1 million Facebook users in a month, you can still leverage this strategy. Let’s assume your business has a well known competitor, “Company Z” in the same metropolitan area. One way you can tap into this customer interest strategy in your Facebook ads is by targeting customers of “Company Z”. That way, you’re advertising to a target audience that already has your qualifying customer characteristics. What your Facebook ads will need to do is selling Company Z’s customers on your product differentiators. In any case, most of Company Z’s customers may be open to similar products with more competitive pricing or offers. And even if not everyone converts? 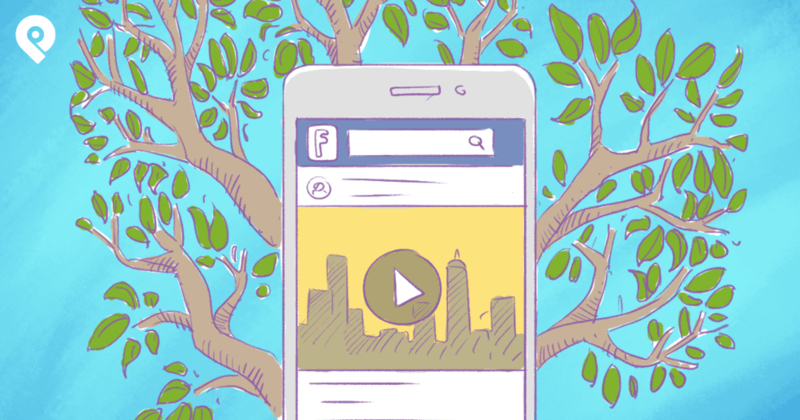 You’re introducing your business’ brand to Facebook users of the local community. When it comes to choosing the product or service of any particular business, the bottom line for customers is clear: Customers pick the choice that offers more value for their dollar. What shows a commitment to delivering value more than providing something for free upfront? No, this doesn’t have to be a physically tangible item. Think about something valuable that your business can offer. That’s exactly what Ryan Deiss did. You see, Ryan is the founder of a company known as Digital Marketer. 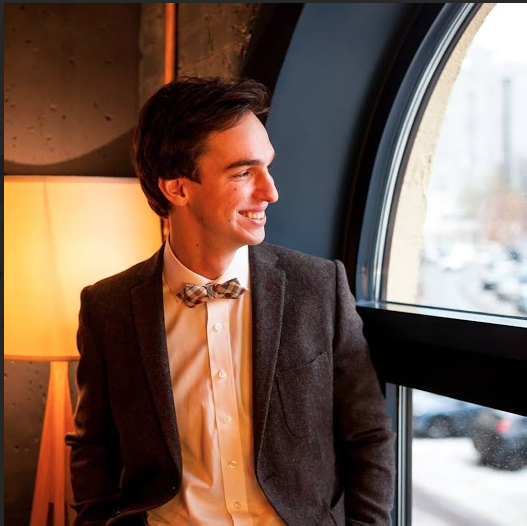 Back when he was just kickstarting his Facebook ad strategy, he managed to obtain 28,500 leads in a little over a month. He did this by giving away a free social media swipe file. This single action showcased his commitment to delivering value and the quality of his work. Now, this Facebook ad strategy isn't just Ryan’s secret, but our open secret. Unfortunately, not all businesses can afford to give something away for free; be it resources or time. And the fact of the matter is only 4% of most website visitors are actually ready to buy as Hubspot has pointed out time and time again. But that doesn’t mean you can’t offer something that’s not free, but just as valuable for when potential customers are ready to buy. You can do a whole lot more to entice potential customers. 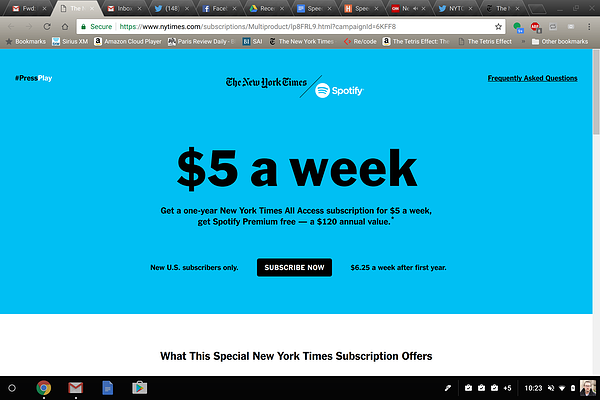 One great example I’ve recently come across is the New York Times offering a $5 per week subscription with free Spotify. Coupons and discounts are great lead magnets for your Facebook ads. They drive brand awareness to any new Facebook business page and present a gift to those ready to buy. And if you’re worried about the price, don’t be. Why? Because it’s human to value free things less due to perceived value. Just consider the last time you got free admission to an event... versus the time you paid an arm and leg to go see the Beyonce in concert. How likely were you to bail on the free event over the expensive concert? Let’s face it, you’re much more likely to not even show up to a free event. What remains is the urgency for potential customers to act. You can create this sense of urgency in your Facebook ads by putting a time limit on your offer. 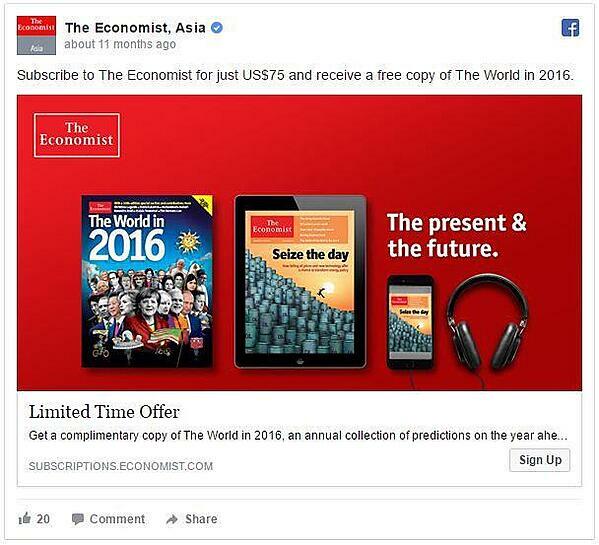 This Facebook ad from The Economist clearly indicates their free resource is a “Limited Time Offer”—encouraging Facebook users to act immediately. We’ve all seen a number of ads over and over again. They can get dull, or even become a constant nuisance in our lives... darn those TV commercials! While there’s no such thing as adblocker on the Facebook platform, research has found that showing the same ad repeatedly can cause customer conversions to drop off. To counter this problem, I want to introduce you to the strategy of sequential retargeting. Sequential retargeting is an advertising strategy that allows business owners like yourself to target different ads to the same audience over the course of their buying lifecycle. The best part is, Facebook ads support sequential retargeting incredibly well. As you can see, the sequence of ads was designed to market new product differentiators to potential customers. Starting from the beginning of the buyer lifecycle, we can see a special discount offer might draw the attention of your target audience. Fast forwarding through the buyer lifecycle to when a Facebook user converts, you don’t just stop there. 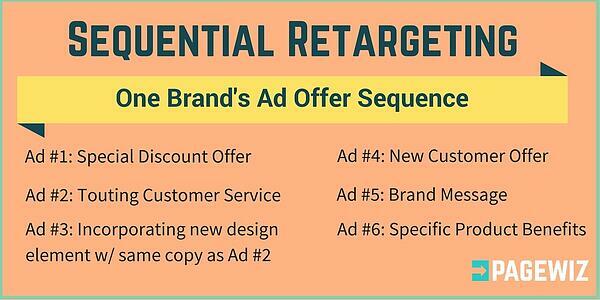 Sequential retargeting ads continue, only now with offers tailored to new customers. This is a great way to convert new customers and keep current customers in the loop. And it's especially helpful if your product or service isn’t subscription based, meaning you’re constantly engaging with customers to re-purchase. Besides supporting the ongoing conversion of your Facebook ads audience, sequential retargeting can also serve as a way to test the effectiveness of different offers. For instance, AdEspresso ran a sequential retargeting experiment using Facebook lead ads and found that their offers performed better in Facebook lead ads performed better compared to landing pages. As a business owner, I’ll bet you’ve wished that you could clone your most loyal customer. Because who wouldn’t want more fans? While I haven't figured out how to clone humans (yet), I have the next best thing to share with you. Facebook ads have a feature known as Lookalike Audiences. 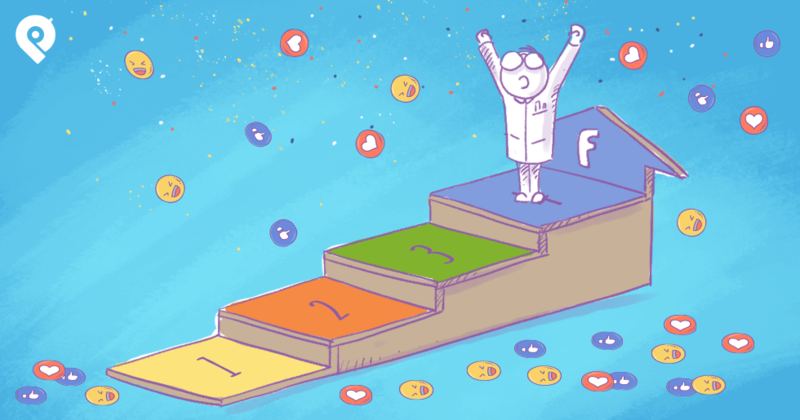 Just like its name, it’s a way to deliver Facebook ads to people with the same interests, demographics, and buying patterns as your best customers. Not surprisingly, Lookalike Audiences are one of the highest converting Facebook ads. You might get a sense that Lookalike Audiences are similar to retargeting Facebook ads. But their is a difference. Lookalike Audiences are reaching those that have never interacted with your business, while retargeting ads are reaching those that have already been exposed to your brand. As a business owner and marketer, you can start using Facebook Lookalike Audiences by introducing your brand with an engagement campaign. You’re looking to introduce new Lookalike Audiences to your line of yoga pants. Without a doubt, these are people that practice yoga and have purchased yoga pants in the past. 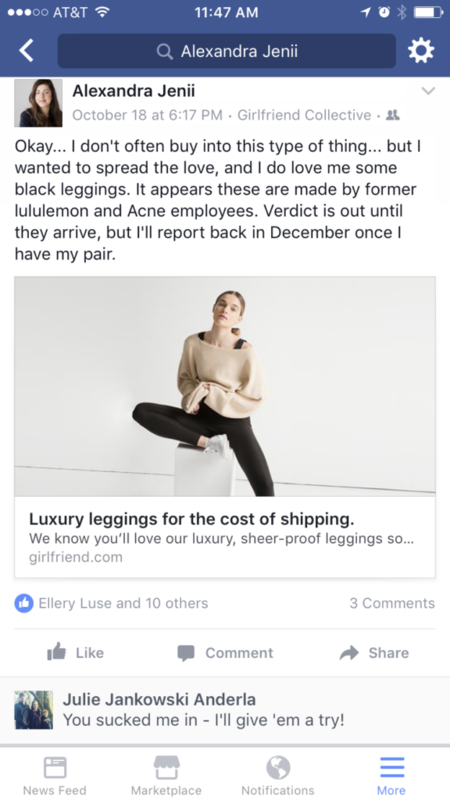 With this in mind, share a Facebook ad with this audience that shows your yoga pants in action. Now you've given these yoga practitioners an idea of your company and its quality. When a Facebook user from your Lookalike Audience ultimately engages with this introductory Facebook ad, this is where you can start the retargeting phase. As I had mentioned before, retargeting is primarily for those already exposed to your brand and/or further down the buyer’s journey. No, I’m not suggesting you have to offer your product for free but just imagine the buzz it’ll generate. In any case, I know for a fact that hosting giveaway contests can be just as effective but requires that you lower costs. If you’re thinking: this is adding work to my retargeting Facebook ads... you’re right. But it’s little work for an even greater outcome. According to Facebook, one particular travel agency was able to reduce their Facebook ad spend by 70% using Lookalike Audiences. That means whatever result Facebook ad retargeting is delivering, you can potentially achieve the same results at 30% of the cost of using Lookalike Audiences. The whole idea is simple. Facebook Lookalike Audiences is a budget friendly way for business owners because you restrict ad spend to qualified leads. All you need to do is fill in the information below under your Facebook ads tab to get started! 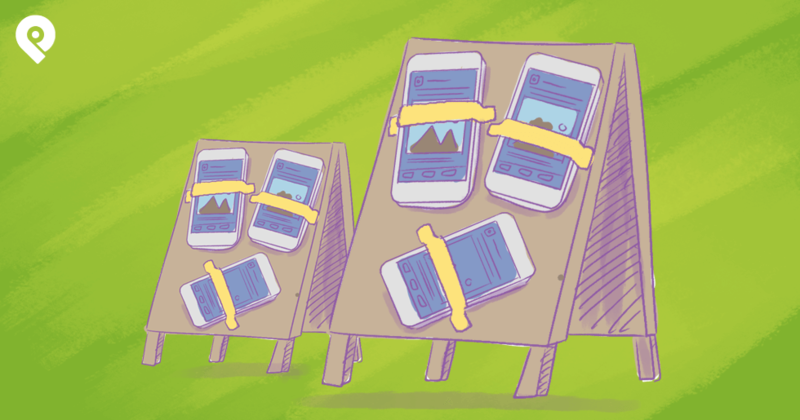 Pro tip: Make your Lookalike Audience size small for the most optimal results. 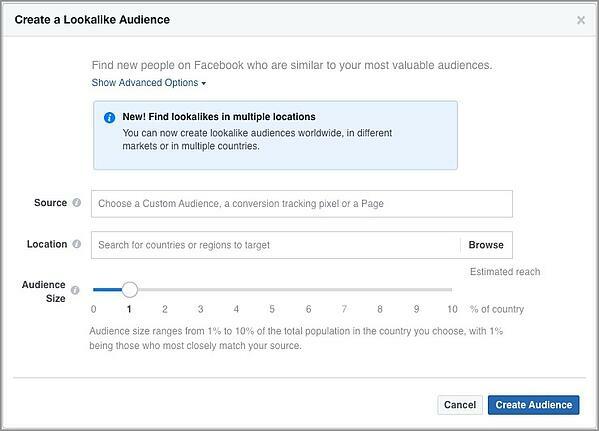 Keep in mind that you can create more than one Lookalike Audience to better tailor your Facebook ads using interest based targeting. 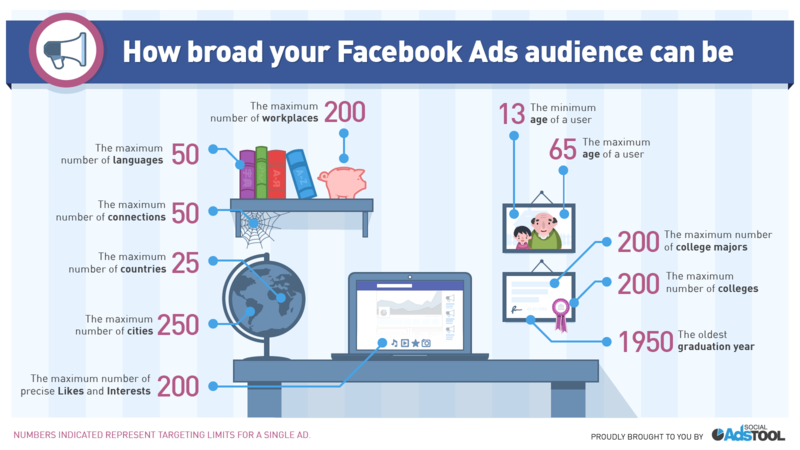 Facebook ads offer business owners a simple way to build a lead generation engine that works within a limited marketing budget. Now that you have some new Facebook ad strategies to work with, give the strategies that fit your marketing plan a try. How you decide to nurture these Facebook leads, whether through personal emails or having your salesperson reach out is up to you. The Facebook ad strategies I’ve shared today will continue to work whether you’re selling to B2B or building up your e-commerce store. Identifying your customer personas is the best first step to take when implementing a Facebook ad strategy for the very first time.